The same project can use two or more different colors of concrete pavers. Textures can also be mixed. Roman is tumbled to soften the edges and give the classic look of hand hewn stone. The earth tone colors harmonize with any decor, blending naturally into the landscape, aging gracefully to provide paving with a timeless elegance. 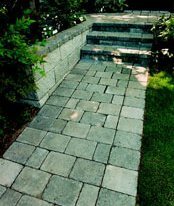 Check the other pages of the concrete pavers section for other styles.